The technique of smoking cheeses dates back to remote times. Smoking was used to preserve meat and fish so that it could be eaten during the winter when other natural resources suitable for food preservation such as salt were not available. This cheese offers a distinctive fragrance of woodland and burnt wood which brings back pleasant recollections of the smell of the hearth and the atmosphere when the grandparents would sit next to it to rest, eating a good slice of cheese. An ancient flavour that is particularly appreciated by gourmets and gourmands. 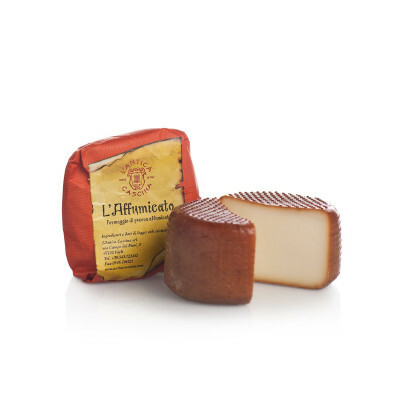 The cheese is vacuum-packed and accompained by a parchment shaped label.